The narrator, Sam, and his friend Bill are down in Summit, Alabama (a town as “flat as a flannel-cake”) when they are struck with the idea for the kidnapping. The two men need two thousand dollars to pull off a real estate scheme in Illinois. They’ve noted that “philoprogenitiveness” is “strong” in these semi-rural areas, so a “kidnapping project” ought to be a success—especially in a town small enough to lack interfering local journalists or a well-trained police force. From the very beginning, the story invokes delusion and irony, as the setting is a flat town whose name is “Summit” (evoking mountain peaks). The crooks at the story’s center condescend to the townspeople, assuming that they are backwards and incapable of thwarting the kidnapping scheme—reasoning that proves just as delusional as the town’s name. Furthermore, Sam’s use of the word “philoprogenitiveness” (meaning the love of one’s children) shows his silliness and pretentiousness. Sam wants to appear serious and intelligent, but he just comes across as ridiculous. Sam and Bill select as their victim Johnny Dorset, the ten year old red-haired only child of “prominent citizen” Ebenezer Dorset. Ebenezer is a “collection-plate passer and forecloser” who Sam and Bill believe can easily afford a $2000 ransom. The men store supplies in a nearby cave two miles from town and, after sundown, they drive a rented buggy past Ebenezer’s house and try to entice Johnny, who is playing outside, into the buggy with an offer of candy. Johnny, who is “throwing rocks at a kitten,” responds to their offer by hitting Bill in the eye with a piece of brick. The logic of the kidnapping at first seems rational. For maximum impact, it seems effective to take the only child of a rich and important local citizen. However, the plan immediately goes awry when Johnny is not the well-mannered upper-class child they anticipated. The first aspect of their plan (bribing him with candy) immediately earns them physical violence, which is what they deserve for their abhorrent actions, but it is also a surprising act of violence from someone who was meant to be their victim. This shows that their plan cannot account for the complexity of reality, and that the locals are unpredictable. Bill vows that the brick will cost Johnny’s father an extra $500 ransom as they wrestle Johnny into the buggy. The boy struggles “like a welter-weight cinnamon bear” but they take him to the cave where Bill is left to watch him while Sam returns the buggy to town and then walks back to the remote cave. When Johnny hits Bill with the brick, Bill isn’t violent to Johnny in turn—instead, he grouses about how the trouble will cost his father extra money (a threat he doesn’t even follow up on). This begins to suggest Bill’s patience, even under duress. Furthermore, the description of Johnny struggling like a “welter-weight cinnamon bear” cues readers to see the kidnapping as comical and bungled, rather than sinister and frightening. Neither the kidnappers nor the kidnapped seems particularly frightened or cruel. When Sam returns, he discovers Bill tending to scratches and bruises, but the scene is calm with a fire and a pot of coffee. Johnny has “two buzzard tailfeathers stuck in his red hair.” Bill explains, “We’re playing Indian,” and that he is Red Chief’s captive, “to be scalped at daybreak.” Sam observes that the boy is happy camping in the cave and playing with Bill. Johnny also names Sam “Snake-eye, the Spy” and tells him he will be broiled at the stake at sunrise. The three eat supper together. Instead of being afraid, upset, or even sullen, kidnapped Johnny seems to be having a wonderful time. This is another example of the townspeople not behaving as Bill and Sam anticipated. Furthermore, Bill’s patience is on display again here. Johnny clearly injured him, but Bill’s generous explanation is that they are role playing. Not only does this show that incorporating Bill into his fantasy life has given Johnny real power over this man, but it also literally reverses the terms of the kidnapping, foreshadowing further reversals to come. These purportedly dangerous criminals and kidnappers have taken on the role of camp counselors or even surrogate parents, which shows the extent to which this kidnapping is off the rails. Furthermore, Johnny’s soliloquy is funny and touching, softening Johnny’s previous violence. Clearly, Johnny is simply a young boy who is naïve but curious about the world and is starved for somebody to listen to him. This passage, particularly the moment in which Johnny begs not to go home, hints that his home life is so troubled that he would rather be kidnapped and living in a rustic cave than at home with his rich but cruel father, which intensifies the reader’s sympathy for Johnny’s plight and contextualizes his prior violent behavior. Sam and Bill go to sleep with Johnny between them, not afraid he will run away. He continues to play his fantasy for hours, jumping up at sounds outside the cave, and trying to rouse his new friends with shouts of “Hist! pard.” Sam has a bad dream where he is kidnapped by a pirate with red hair and, at daybreak, awakes to Bill’s “indecent, terrifying, humiliating screams” as Johnny, playing Red Chief, acts as though he is trying to scalp Bill. Bill and Sam making Johnny sleep between them is an ambiguous gesture: while it seems restrictive at first, they claim that they are not afraid he would escape, so this seems to have an aspect of protective tenderness, as well. In any case, Johnny's refusal to be tamed continues with fantasy play late into the night, leading Sam to have a bad dream about a red-headed pirate, which is clearly a stand-in for the red-headed Johnny who has already gained tremendous power over his captors in real life. When Bill awakens to being scalped in the morning, Sam describes Bill’s screams as unmanly, thus reserving his harshest criticism for his friend, rather than his young attacker. Sam takes the knife from Johnny and makes him lay down, but Bill is shaken and doesn’t sleep. Sam dozes for a while but wakes early, remembering Johnny’s fantasy threat to burn him at the stake. Bill asks why he’s up so early and Sam claims he has a pain in his shoulder, but Bill accuses him of being afraid of the boy, and asks whether anyone would pay money to get “a little imp like that” back. Sam reassures him that parents dote on rowdy kids and tells him to cook breakfast for Johnny while he goes up to the mountain top to observe any activity around them. As Johnny’s primary playmate, Bill has taken the brunt of his abuse while Sam has been the executive of their ransom enterprise. Now, with dawn of the first day following the kidnapping, Sam is also a bit nervous about what Johnny might do to him in his sleep, and Bill jumps at the chance to call Sam out when he shows he is not immune to Johnny’s terrors. In this way, the two continue to bicker, rather than focusing on the job at hand, which makes it difficult to address the unexpected question of who in their right mind would pay for the return of such a terrible child? Sam asserts (without any personal knowledge of course) that parents dote on rowdy kids. He has not yet grasped the depth of their problems, as he goes off to try to familiarize himself with the unfamiliar area. Sam goes up on the peak of a nearby mountain and sees nothing to indicate that anyone is concerned about a missing child. He expected to see the local population armed with pitchforks, searching for kidnappers, but instead all is peaceful across the landscape. He likens his capture of Johnny to wolves taking a lamb, but doubt creeps into his mind as he thinks, “Heaven help the wolves!” Sam returns to the camp for breakfast only to find that Johnny is once again threatening Bill with bodily harm, this time with a rock half the size of a coconut. Bill complains that the boy burned him with a red-hot potato and asks sheepishly if Sam has a gun. Sam's expectation that he would see peasants with pitchforks looking for Johnny contrasts with the reality: nobody seems to care. This is an indication that Sam does not understand the locals as well as he believes he does, casting doubt on the efficacy of their plan. Back in the cave, Bill asks if Sam has a gun. No further mention of a weapon occurs in the story and the fact that weapons have been absent from the story is important: bumbling ineffectiveness is key to maintaining the reader’s sympathy for these crooks since being unarmed signals that they aren’t a threat and gives evidence for how poorly prepared for mayhem these criminals truly are. After breakfast, Johnny takes a leather slingshot and goes out of the cave. Bill is worried, wondering what he’s up to and if he’s trying to run away. Sam tells Bill not to worry, and says that he’s headed to town that night to deliver the ransom message, having seen little evidence in the surrounding area of any concern for the lost boy. Suddenly, with a war-whoop, Johnny attacks Bill with a large black rock, hurled with a sling like David slaying Goliath. The impact sends Bill sprawling into the campfire, and Sam tends to his friend for half an hour, pouring cold water on his head. The idea that Johnny is Bill and Sam’s captive continues to erode as they realize they are the ones who need an exit plan, not Johnny. It's telling that Sam is uttering a sentence about the ransom letter, the key to their plans, just when Johnny knocks Bill over the fire with a slingshot in the style of little David overcoming the giant Goliath. The implication is clear that the tables have turned, and their plans continue to be eclipsed by Johnny's agenda. Bill mentions that his favorite Bible character is King Herod, the King who doubts Jesus and turns him over to the Romans for execution. Sam grabs Johnny and shakes him, reprimands him, and then threatens to take the boy home if he doesn’t behave. Sam makes Johnny apologize and tasks Bill with being Johnny’s playmate while he goes into a neighboring town, Poplar Cove, to see if anyone has heard of a missing child yet. Since King Herod gave up Jesus for execution in the Bible, Bill’s tongue-in-cheek comment underscores a struggle for authority in the story: Bill is suggesting that Johnny, a child who is being treated as special, really is dangerous and needs to be punished, an understandable perspective for one just clobbered with a rock. On the other hand, Johnny promises to behave, and in doing so, makes clear he is not a rebel but a member of their crew who didn't mean to hurt "Old Hank." Sam then encourages Johnny to apologize directly to his partner, calling him "Mr. Bill" as a term of respect, as one might refer to a teacher. Bill and Sam may be newcomers to Summit, but Johnny shows his allegiance to them by apologizing. Being part of their crew is important to him, and he doesn't want to go home. After Bill and Johnny shake hands, Sam tells Bill they should send the “peremptory” ransom note to Ebenezer. Bill reminds Sam that he’s stood by him through many hardships and difficult situations, but he urges him to be quick, since he’s concerned about his own safety around Johnny, whom he calls “that two-legged skyrocket of a kid” and “that forty-pound chunk of freckled wildcat.” Sam agrees to return quickly, and he and Bill work on the ransom letter while Johnny plays Indian Chief, strutting around like he’s the one guarding captives. In tears, Bill convinces Sam to reduce the ransom demand to $1500 from $2000 to increase the likelihood that they will be able to return the troublesome child soon. It becomes clear that Bill and Sam are in over their heads with the ransom scheme, as they have yet to agree upon—let alone issue—a demand. Sam calls the prospective ransom letter “peremptory” (demanding attention or obedience), which will turn out to be another case of wishful thinking, since the matter of payment is anything but settled. Meanwhile, Bill is not happy in his role as primary caretaker. The difficulties with Johnny that lead to the discounting of the ransom are evident in the two colorful words Bill uses to describe Johnny (“skyrocket” and a “wildcat”). Both are not so much insults as grudgingly respectful of Johnny’s energy and power, important factors here foreshadowing the ultimate reversal of fortunes. Although Bill and Sam’s letter to Ebenezer conveys a reduced ransom demand, it still illuminates their lack of situational awareness. For instance, it claims that it is useless for “skillful detectives to attempt to find him,” yet Sam has already observed that no one is looking for him. His elaborate investigation of the roads, crossings, wheat fields, and large trees doesn’t make him a native of the area, just more deluded in thinking he is in control when dealing with Old Dorset. The threat “you’ll never see your boy again” rings hollowest: these men clearly would never hurt Johnny, and it's not even clear that Johnny is missed. The assertion that "these terms are final" is simply untrue, as well, and signing off as "desperate men" is ironic, since it's not their aggression but their weakness that is making them desperate. This is amply illustrated when Johnny, tired of playing Indian, calls for a game of Black Scout, a move that will prove particularly ominous and painful for Bill. Sam tells Johnny that Bill will play his new game, warning Bill that he should keep the child occupied until he returns from delivering the ransom note. As Sam leaves the two, Bill gets down on all fours to play the part of Black Scout’s horse, with Johnny on his back. Sam admonishes Bill to keep the boy interested, saying “Loosen up.” Bill discovers it’s 90 miles to the stockade in Johnny’s fantasy, as Johnny digs his heels into Bill’s side. Bill asks Sam to hurry back and wishes aloud they had made the ransom only $1000. Sam says the Black Scout game “sounds harmless” when clearly this is the most humiliating and potentially damaging game Bill has yet suffered. If Sam seems to be the more deluded of the two, Bill is the primary care-giver to Johnny, and the most abused. Yet Bill’s patience is again in evidence: after being kicked repeatedly as a play horse, he merely threatens to “warm you good” and continues the game. This is the kind of moment that builds sympathy for Bill, but there might be a limit reached for the reader: at what point does a person, particularly a grown man dealing with a child, just seem idiotic rather than sympathetic for putting up with abuse? Sam walks to the neighboring town of Poplar Cove and overhears someone saying all Summit is upset because Johnny has gone missing. Satisfied that the plan is finally working, Sam posts his ransom note to Ebenezer in Summit and leaves to return to the cave and await a response. When Sam returns to the cave, he can’t find Bill or Johnny anywhere, so he waits. After half an hour, Bill returns to camp, wiping his face with a red handkerchief, while Johnny creeps along like a scout behind him. In the first indication that things are actually going as planned for a change, Sam discovers that the local people have at least noticed and are concerned about Johnny’s absence, so some increased confidence in the plan is warranted. Sam's pride is contrasted by Bill’s situation as Johnny's "horse," however, which he finds untenable and humiliating. Sam’s inability to anticipate the seriousness of Bill's growing objections to their criminal endeavor could now be a big issue for their plan. Abused by Johnny, ridden like a horse, bitten, kicked black-and-blue, and forced to eat sand as if it were oats, Bill finally has snapped and, he believes, sent Johnny home because he can no longer tolerate “supernatural tortures.” Pathetically, he describes in detail his reasons for sending this young boy home—something that did not, in fact, happen. So far, Bill has been more aware of the acute reality of their challenges with Johnny than Sam has been, but here he takes a turn towards fantasy, believing that Johnny is gone when the boy is, in fact, right behind him. Sam asks Bill to turn around and see that Johnny has been following behind him all along. Bill sees him and sits down in resignation, plucking at grass and sticks in a hopeless state. Sam encourages him with the thought that the kidnapping scheme might soon come to a conclusion, and Bill recovers enough to promise Johnny yet another fantasy game with him, playing a Russian in a Japanese war. When Sam tells Bill to turn around to see Johnny is still there with them, it causes Bill to flop down on the ground and pluck at grass and sticks. This slapstick moment has significance in that usually Sam is deluded while Bill sees their situation all too clearly, but here Sam is literally telling Bill to open his eyes and look at what’s in front of him. The result of pulling the wool from his eyes is shock, apparently, and a full hour of withdrawal from the world. When he comes around, Sam is once again the deluded one, insisting that the scheme will go forward. Sam climbs the tree above the arranged drop off location to await Ebenezer’s answer. At the appointed time, a young messenger rides up on a bicycle, slips a folder paper into the box at the foot of the fencepost, and rides back toward Summit. Sam waits an hour to avoid “being caught by counterplots” and then, believing no one is watching, comes down to get the note and returns to the cave. Once there, he observes the note was written in a “crabbed hand,” and he reads it to Bill by the light of a lantern. Sam believes things are going well because he has sent a threatening letter and is receiving a reply. However, despite his assertion that his behavior resembles that of professional kidnappers, Sam actually seems to be participating in fantasy play similar to Johnny’s—after all, he is climbing trees and playing hide and seek with a “half-grown boy” who brings the response from Ebenezer. The "crabbed hand" with which the letter of response is written shows the age of the respondent, which might indicate that Ebenezer is weak—the substance of the letter will upend that implication. Ebenezer’s letter declares that Sam’s ransom demand is too high, and he makes a counter-proposition: they are to return the boy and pay Ebenezer $250 to take Johnny back. Ebenezer recommends that they come at night, since he can’t be responsible for the actions of his neighbors (who believe Johnny is lost) should Sam and Bill be seen during the day bringing back his troublesome boy. In his letter of response, Ebenezer turns the tables and suggests that it’s Bill and Sam who should pay to end this debacle, not he. This reversal is a climax of the plot, establishing Ebenezer as the dominant actor, credibly threatening them in order to get what he wants. Amusingly, it is somewhat unclear if the neighbors would be angry with Sam and Bill for taking Johnny or for bringing him back. In any case, his signature (“very respectfully”) is the sort of business-like formality that is a recognizable feature of otherwise cut-throat business communications. Sam is shocked at the audacity of Ebenezer’s response, but Bill is relieved to think their ordeal may finally be at an end. Bill argues that $250 is a low price for freedom from Johnny, and he urges Sam to agree to the counter offer. Sam agrees Johnny is too much trouble and that they should cut their losses. They lie to Johnny that his father bought him a silver-mounted rifle and moccasins, and they say that they will take him bear-hunting if he will agree to go home. Sam's reaction to Ebenezer's letter is shock, of course, since to this point he has deluded himself that the kidnapping has a chance of succeeding. Sam and Bill's inability to make good on their threats to hurt Johnny is key to their coming acquiescence to Ebenezer's powerful response. In complying with Johnny's father's demands, they see the only way out of an improbably difficult situation—namely, that they haven't the heart to hurt anyone, and they are terrified of both Johnny and his father. In fact, Johnny's father is such a strong figure in their minds that they use a lie about him buying Johnny a silver rifle and moccasins for a bear-hunting trip as bait to lure Johnny home. It's heartbreaking, highlighting as it does how sad and disappointing the child’s life has been with his father. At midnight, Sam and Bill bring Johnny to Ebenezer’s house in Summit and pay him $250. Johnny, upset when realizing his friends are leaving, clings to Bill’s leg and has to be peeled away by his father. Old Dorset restrains his son, saying, “I’m not as strong as I used to be… but I think I can promise you ten minutes.” Bill outruns Sam, as the two of them leg it out of town, headed perhaps to the Canadian border. In the final action, Johnny clings to Bill, rather than to his father, and the father restrains his son while Bill and Sam make their getaway. It’s a denouement that is both strangely sad and funny, illustrating that Johnny's home is no home, and that the strangers who came to town without a clue are leaving it considerably more knowledgeable about who runs things. Houghton, David. "The Ransom of Red Chief The Ransom of Red Chief." LitCharts. 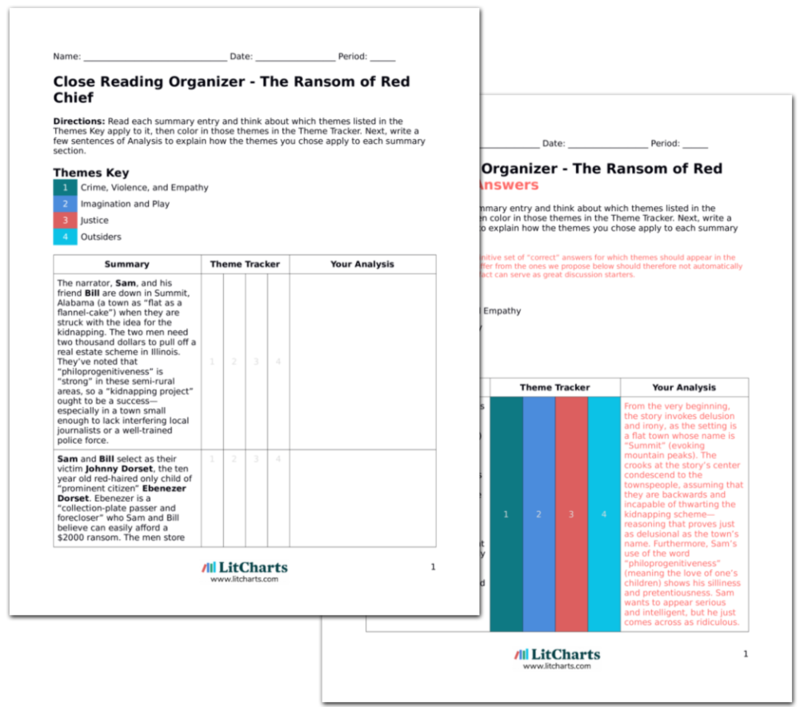 LitCharts LLC, 8 Oct 2018. Web. 11 Dec 2018. Houghton, David. 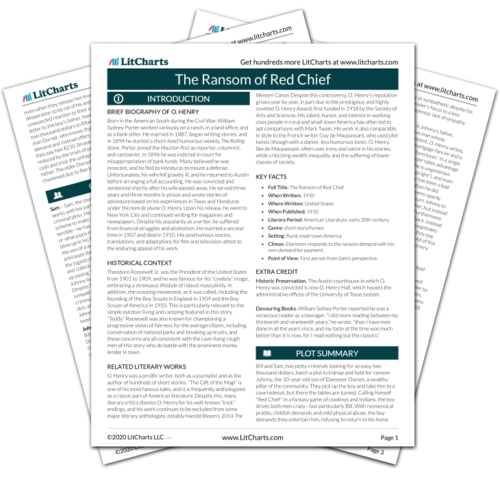 "The Ransom of Red Chief The Ransom of Red Chief." LitCharts LLC, October 8, 2018. 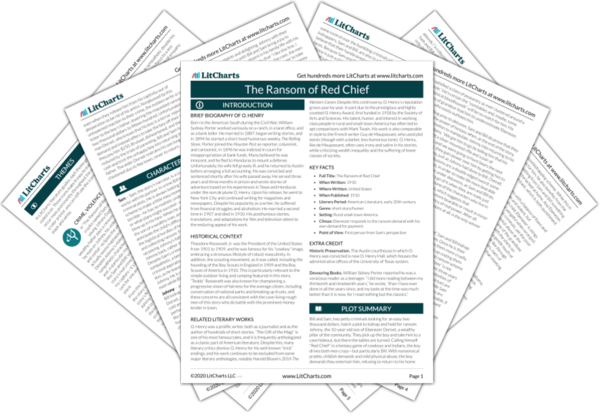 Retrieved December 11, 2018. https://www.litcharts.com/lit/the-ransom-of-red-chief/summary-and-analysis.